After a power-delayed start of 43 minutes due to a wild summer storm in Sydney for the second consecutive year at Drummoyne Oval, the North Melbourne Tasmanian Kangaroos were victors over the GWS Giants by 25 points. It was a scrappy wet start to the match. Giant’s players Jessica Dal Pos and Emma Swanson were deep in North Melbourne’s goal square and showed desperate efforts. Swanson came off second best as her shoulder slammed into the goal post. Giants midfielder Alicia Eva put through the first goal for the Giants and the first of the match. 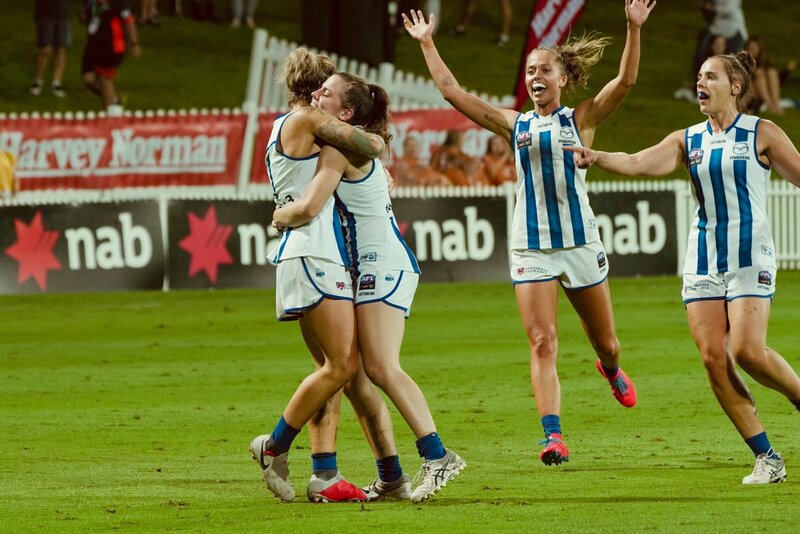 North Melbourne responded quickly with a goal of their own after a centre clearance from Emma Kearney who kicked the ball forward and Jasmine Garner was on the end of the ball. Garner booted through the classy goal. A 50m free kick off the ball awarded to former Blue and current North Melbourne Melbourne’s Kate Gillespie-Jones. Gillespie-Jones nailed her first ever AFLW goal. Staunton began lively in the forward line with her pressure on and off the ball. North Melbourne was cleaner with their skills despite the wet conditions in a cracking opening quarter from both teams. North Melbourne were up by a goal over the Giants at quarter time. North Melbourne dominated the second term, but only had one goal to show for all their efforts in the quarter. The Giants let themselves down in front of goal. Kaitlyn Ashmore applied a ferocious tackle on Giants captain Amanda Farrugia. Staunton continued her relentless forward pressure from the first term and strong influence on the match. Garner and Ashmore combined as they set up teammate and North’s number one draft pick Daisy Bateman. Bateman kicked an impressive snap goal in the wet and her first for her new team North Melbourne. Ashmore worked hard in the first half of the match. Lights went out late in the second quarter and play stopped. Play resumed at Drummoyne Oval after 20 minutes. Kearney was prolific in the first half with 14 disposals. At the main break North Melbourne were up by a goal. Early in the third quarter promising young midfielder Ash Riddell was in the hands of the trainers. The game developed into a real slugfest in the extremely challenging conditions. Jenna Bruton pushed the football forward to Abbatangelo who kicked to Emma King but Rebecca Beeson intercepted. Under pressure in defense from King, Beeson turned over the football to Abbatangelo. Abbatangelo kicked a well-deserved first ever AFLW goal. The Giants responded straightaway through Courtney Gum who kicked the football forward to Irishwoman Yvonne Bonner who slotted the goal on the run. Both teams played well in the terrible conditions. There was a lot of momentum shifts in the third quarter in a very contested match. North Melbourne led by eight points at three quarter time. Kearney had 19 touches, Bruton had 18 touches and former Magpie Jess Duffin had 16 touches at the end of the third quarter. Riddell’s night finished early at three quarter time with an ankle injury. North Melbourne took control in the final stanza off the Giants, as they scored three goals and kept the Giants goalless. Giants Louise Stephenson gave away a free kick to King who slotted the goal truly. There was a head clash halfway through the fourth quarter between Giants Pepa Randall and Moana Hope and Hope came off second best. King was on fire in the forward line for North Melbourne, as Abbatangelo kicked the football to King who was on her own in the goal square. King nailed through the goal between the big sticks. North Melbourne’s skills were truly on display in the atrocious conditions. Staunton was the shining light for the Giants all night up forward with her impressive pressure and intensity. Also Staunton almost kicked a goal of the year contender on the run after a clever side step but was run down at the last hurdle. Bateman was dynamic for North Melbourne up forward and slotted through her second goal from the goal square. North Melbourne finished with a flurry of goals in the last quarter. Kearney finished with 22 disposals. In trying conditions and a match that had it all, North Melbourne prevailed and came away with the solid 25 point win over the GWS Giants. With the win North Melbourne remain undefeated in AFLW 3.0.